It’s been an odd week – alternately frantic and quiet. Busy days, quiet evenings. It’s not a bad combination I suppose. I am getting that horrible sensation of stress rising up out of the abyss and I’m not sure how to slow it down. More Lego probably! It’s the stress that’s waking me up in the night and making me want that extra final whiskey of the evening. On Friday I finally allowed my cold to catch up with me and spent the day working from home in my pyjamas with a filthy stuffed noggin and headache. I made myself feel better in the evening with some serious grog, a Merly-Boo and a good book. I bought a cheap bottle of Cockspur‘s golden run, which is a decent grog filling. It’s even better in a mug half-filled with Caramel Sauce and a spot of milk. The second grogging round was just with the traditional golden syrup. Mmm, couldn’t even feel my face. To avoid thinking any more than is strictly necessary I’ve dug myself back into reading and getting some writing done. I’m very happy to have been writing and posting stuff for four days of the week over the last fortnight. It’s a routine I’d be delighted to maintain. It’s a target I guess and one that just might be possible… until work turns thoroughly insane and tries to kill me. Having now written two new chapters of The Desert Crystals I can feel the story coming back to me and the voices of some of the characters. Hopefully the rest of them will come back to me too. This week, Monday 20th January 2014 – mutinous princely babblings. Televisual Ambivalence – BBC3’s best and worst (right now). Strange you write about how much you dislike someone only to immediately have them follow you on Twitter. Strange. Or possibly just their media rep getting busy. Lego Blog: Santa Mecha-Claus – huge robot Santa action! The Desert Crystals – Part 26: Spirals – just because you get out a dangerous situation doesn’t mean another isn’t waiting to pounce. I loathed him as Kirk in both of those terrible Star Trek films. He’s bland, blank and aside from his striking blue eyes has no merit or place on a cinema screen. At least in this he’s matched by Keira Knightley, so he doesn’t seem quite so freakish. It’s a pretty terrible film all round – Pine fails to convince as a person, let alone as someone in the marines / on a plane / in a bank / CIA / being upset / sweating. His hands shake a bit after he drowns a guy in a bath – that’s about the extent of his acting prowess here. Knightley’s actually not too bad. There’s a lot of jaw acting going on but y’know, with Kenneth Branagh to compete with on the firm lips and gritty jaw stuff she’s shown to be a mere amateur. Kevin Costner makes a brave effort to look remotely interested in what’s happening when he’s on screen but even he can’t be arsed to do much running around. It doesn’t really matter what the film’s about – it’s some money thing where the Russians (damn those pesky ex-Commies) are going to blow a hole in the US economy (I thought that’s what the US government was for?) and blow a hole in Wall Street with a bomb. If you ever struggle to understand the plot of a film you should go and watch this as they explain every step the characters make. It’s a relief actually as it meant I could pay attention to how exciting monitors full of currency charts are. It isn’t clear why there’s the bombing plan. I suppose it would end (more) anti-climatically if they just uploaded the e-doohickey and went home. 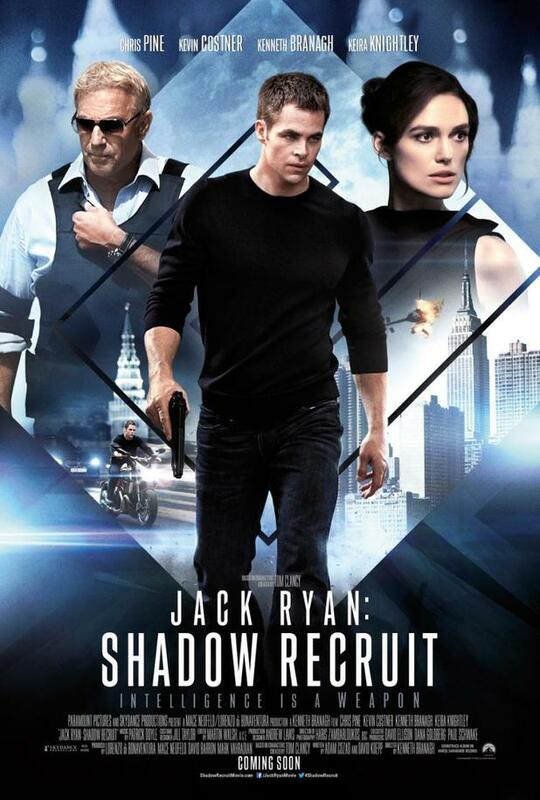 By far the worst in a series of average films about Jack Ryan. It’s sole interesting feature was finding a new way to torture a lady (how else would Jack and the CIA be motivated to save the world if his girlfriend wasn’t in danger?) – an energy saving light bulb in the gob.